Missouri Attorney General and then-Senate candidate Josh Hawley poses for photos with supporters at a campaign event in Chesterfield on Oct. 29. Hawley’s win marks the second straight election cycle where Missouri Republicans emerged as the clear victors, a sign that a state where Democrats once ruled the roost is now deep red. Much of the credit goes to President Donald Trump. But even with solid state and legislative performances, Missourians still showed some affinity for approving left-of-center policy proposals. That includes approval of ballot items raising the minimum wage and overhauling state legislative redistricting. St. Louis Public Radio's Jason Rosenbaum and Jo Mannies break down Tuesday's election results. To explain things further, let’s answer the eight questions that were posed in this column before Missourians (and, in at least one question, Illinoisans) rendered their verdict. “We need somebody who is going to stand for Missouri, vote for Missouri; Sen. McCaskill hasn’t heard a thing that people said,” said Hawley last week in Jefferson County. And the strategy paid off. Hawley won by upward of 50 percentage points in rural counties that Trump captured in 2016. He also won in some key areas of the state that gravitated to the president by solid margins, including Jefferson, Buchanan, St. Charles and Greene counties. This strategy wasn’t without risk. If Missourians soured on Trump after backing him in 2016 by a landslide, then Hawley wouldn’t have much wiggle room to disconnect from his shadow. But that didn’t end up happening, as most polls showed Trump’s approval ratings were around 50 percent. 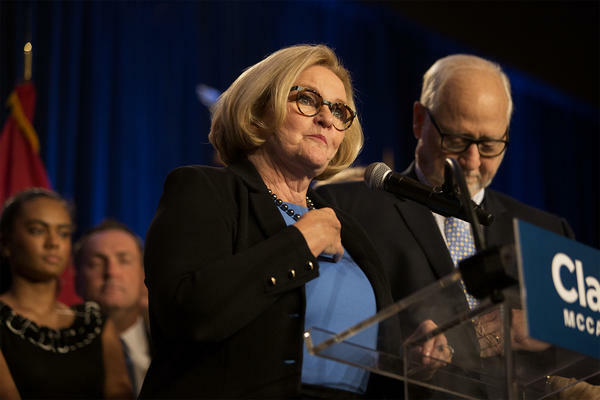 McCaskill needed three things to happen Tuesday night: Win urban parts of the state by a huge margin, win competitive suburbs and be competitive in rural parts of the state. She only ended up accomplishing one of those goals, getting robust results in St. Louis and Kansas City. The two-term senator spent months holding town halls in places where Trump excelled, and sought to reach out to a diverse slate of voters with her emphasis on health care and trade. She even pointed to some area of agreement with Trump, particularly on immigration policy. None of that hustle ended up paying dividends, as she lost some rural and exurban areas of the state by wide margins. 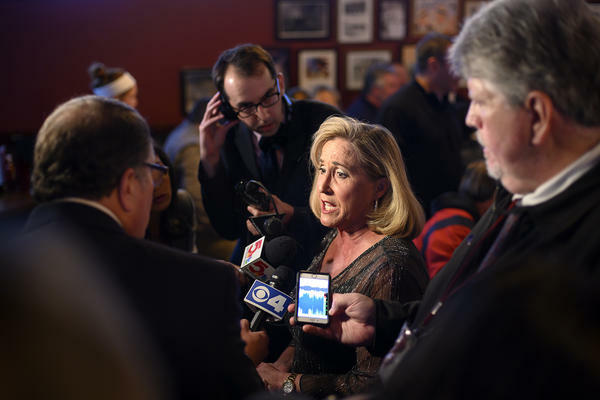 And now that McCaskill lost, national Democrats may be wary of shelling out the money and energy needed to win a statewide here — especially since efforts to elect Chris Koster and Jason Kander also faltered. “I would argue the Obama presidency left outstate Missourians who were Democrats or Democratic-leaning independents, it sort of left them with nowhere to go,” said former Lt. Gov. Peter Kinder. 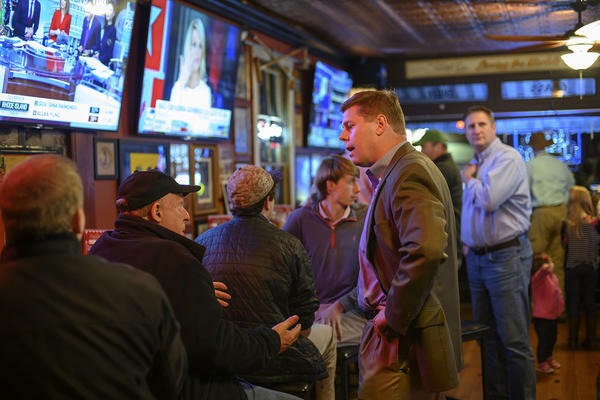 In some respects, both of the 2nd District contenders ended up doing their jobs. 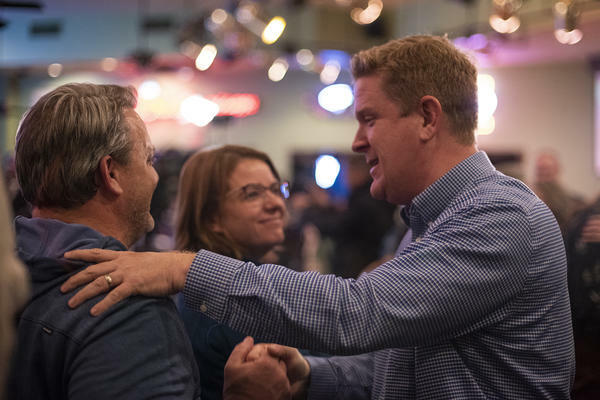 Wagner was able to win by big margins in St. Charles and Jefferson counties, while VanOstran came close to besting the Ballwin Republican in St. Louis County. But since Hawley’s margin of victory was so large in rural and exurban parts of the state, in some ways it was less important about how Wagner or VanOstran did. But it could be argued that both candidates ended up helping in different ways. Wagner greatly assisted Hawley by not entering the GOP primary for Senate — and giving Hawley a much easier path to take on McCaskill. And her rigorous campaign insight likely helped some state legislative candidates prevail in difficult races. Actually, neither state Auditor Nicole Galloway nor Republican challenger Saundra McDowell were pulled across the finish line by their respective Senate candidates. That’s because Galloway managed to win by about six percentage points, even with McCaskill’s defeat. But in some respects, Galloway’s performance left a little to be desired. McDowell raised little money and had little organizational support from the Missouri Republican Party. If McDowell had run in, say, 2008, she probably would have lost to Galloway by double digits. Still, in an environment where Democrats aren’t exactly setting the world on fire, maintaining a statewide office is a glimmer of hope for the state party. Whether Galloway ends up being at the top of the ticket in 2020 as a gubernatorial hopeful, though, remains to be seen, as she’s stressed her main focus this cycle was to get elected to a full four-year term. Democrats were bullish that a wobbly national environment for Republicans would finally give them an opening to pick up some state legislative seats. But it wasn’t to be, as the GOP was able to prevent Democrats from gaining any seats in the House or Senate. For the first time probably in Missouri history, Republicans now hold every single state legislative seat in Jefferson County. House Speaker Elijah Haahr said the results defied all expectations for the GOP. Democrats were able to pick off two seats in the Kansas City area and one seat that straddles St. Louis and St. Charles counties. Two of those wins were very close, and may end up going to a recount. Even though Democrat JB Pritzker demolished Illinois Gov. Bruce Rauner, it wasn’t enough to push St. Clair County State’s Attorney Brendan Kelly past Congressman Mike Bost. Although Illinois’ 12th District is historically Democratic-leaning, it’s clearly become more Republican over the past three cycles — especially since Trump is still popular there. As much as Trump probably helped, Bost himself has once again proven to be the ultimate iron man of Illinois politics. Even against a solid opponent like Kelly, he was able to win as other Republicans on a federal and state level were shellacked by a Democratic wave. Even with Gov. Mike Parson and Lt. Gov. Mike Kehoe leading the charge, Proposition D faltered at the ballot box. There are a bunch of theories why, including Missouri voters’ aversion to tax increases and perhaps about the complexity of the proposal. Some proceeds from the 10 cent gas tax hike went to the Missouri Highway Patrol, with the idea that such a move would free up money for transportation projects. Tuesday showed that even the gubernatorial bully pulpit can’t convince voters to do everything. And it means that Parson and the legislature will have to figure out another way to bring more money for Missouri’s transportation needs. 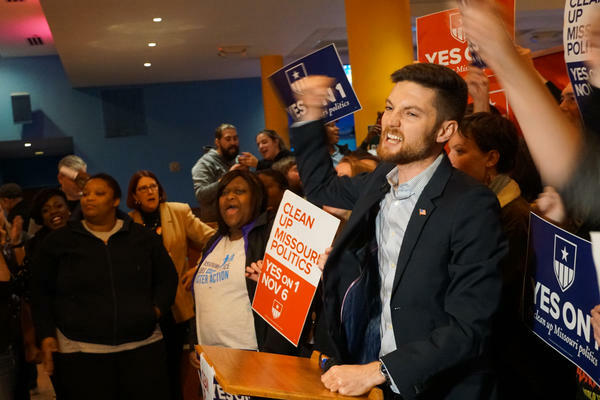 Even though Republicans teamed up with some African-American elected officials to defeat Amendment 1, Clean Missouri ended up passing with nearly 60 percent of the vote. It won majorities in all parts of the state, including counties which Hawley won in a landslide. The proponents had a well-funded, well-organized campaign, while detractors couldn’t get enough money or manpower to combat the measure. That showcased that pairing popular ideas like curtailing lobbyist gifts with an overhaul of state legislative redistricting was a good strategy, allowing the focus to be on curbing "big money" than the complicated minutia of line drawing. But Haahr said the debate over Amendment 1 is not over. It’s very possible that lawmakers could put something else on the ballot in 2020 effectively nullifying the redistricting portion. “I’m kind of enthusiastic about having those conversations and seeing where they go,” he added. On the Trail, an occasional column, weaves together some of the intriguing threads from the world of Illinois and Missouri politics.